Is chess king in Africa? No... Africa is home of world’s #11 checker player!! Chess and Checkers have been friendly cousins for thousands of years. The Moors of Spain were noted players in both of these venerable board games before the each game met their respective transformations. The Senegalese (descendants of the great Moorish Almoravids) are also known as a powerful nation in checkers (called "draughts, but originally known as "el-Quirkat"). It appears that draughts uses the 10X10 board and each side starts with 20 men, but the basic rules for checkers apply. For the uninitiated, draughts has locks, pins, traps and tactics just like chess. The country has produced one of the world's top players in GM Ndiaga Samb who currently is ranked #11 in the World Draughts Federation with a rating of 2380. If one would equate that to the FIDE ratings of chess, he'd no doubt be 2700+. 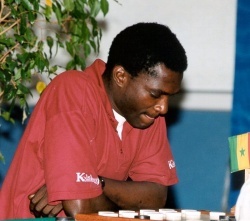 The Senegelese native (now living in Holland) earned his International Master (IM) title in 1992 and his Grandmaster (GM) title last year. He's said to be very aggressive and from seeing his games, he appears to be very tactical. . . in one game, he sacked six men to reel off a winning combination (or coup)! While chess is not very popular in Senegal (or most French-speaking African nations), hopefully the accomplishments of GM Samb (and players like GM Bassem Ba of Senegal) will encourage the players in the region to examine the beauty of board games (sport) like chess. Certainly, the talent of the heralded master is proof that there are chess GMs in the making!! Note: Thanks to Wade Thames of California for sending this information about GM Samb.